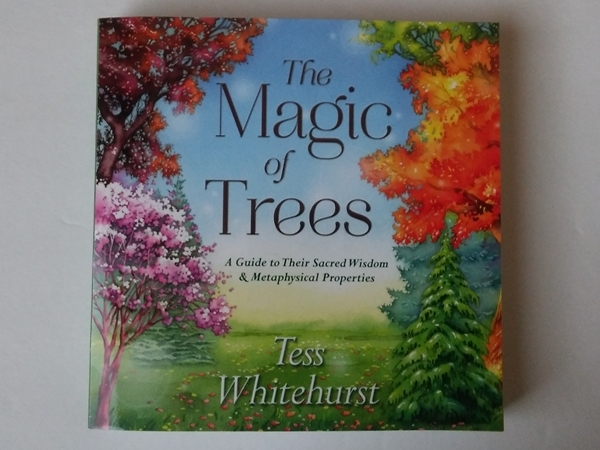 The Magic of Trees is the newest release from the lovely Tess Whitehurst. It's a metaphysical reference guide to trees, which is something I have wanted to exist for the longest time! I'm so glad Tess was the one to write it, because I adore her energy. The book is a healthy 374 pages. The Table of Contents lists the 102 trees in alphabetical order for easy reference. The Introduction explains how Tess came to write the book and her reasoning for the choices she made in selecting the trees to include. The Orientation section walks you through some of the methods of tree magic. 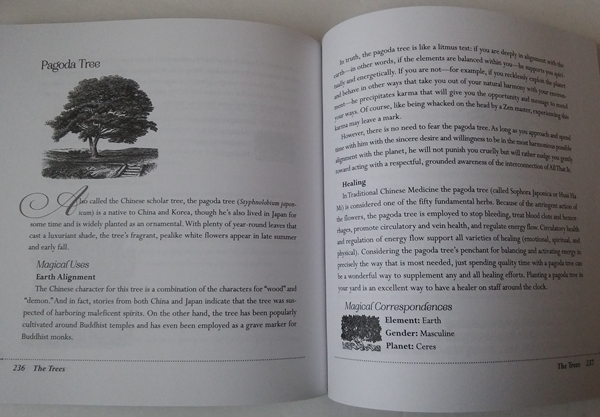 The huge bulk of the book is dedicated to the individual trees and ways to work with each. The book closes with three appendixes. The first lists magical uses and the corresponding trees. For example, if you were looking for a tree to work with to help you set boundaries, you would find Boundaries in the index, and see the trees listed beneath that title that you could work with (Hornbeam, Locust, Plum). This is a wonderful resource. The second appendix lists the five elemental correspondences (Earth, Air, Fire, Water, Spirit) and the trees that fall under each category. The third appendix lists planetary correspondences. One of the valuable things I took away from the book was that you don't need to have access to a tree you want to work with. Whether the weather is bad, you don't have proper transportation, or the tree you want to work with only lives on the other side of the world, Tess explains how you can work with the tree's energy from a distance. This was golden information. I received an early e-copy of this book months ago, but wanted to have the hard copy in hand before reviewing it, as the e-copy did not have images yet, something I felt this type of book absolutely needed. Tess told me that she had fought to have sketches included in the book. It baffles me that this would even be up for debate in a book such as this! Each tree is accompanied by a small sketch. The majority of drawings are of a branch of the tree, so you can see what the leaves/fruit look like. There are a few sketches of a full tree, but for the most part, it's just the leaves. I really would have loved to have seen color photographs of the actual trees, for easier identification, but I understand it's not meant to be a field guide. That would be beyond the scope of the book. There are field guides you can buy to accompany this one, or you can simply use the internet. Each passage begins with a brief introduction to the tree, including the scientific name, history, anecdotes, and sometimes the areas of the world you can find the trees. Again, not being a field guide, you won't find locations for every tree. This introduction is followed by the magical correspondences of the tree, of which there are always a few. The magical uses are varied and plenty. Each tree will have a different variety of them. Some of the many magical uses are healing, love, protection, fairy communication, shadow work, wealth, sleep, shapeshifting, divine feminine, divine masculine and music, just to name a few! 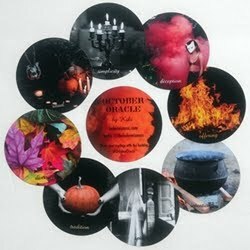 There are also spells, rituals, charms, baths, divination uses, beauty potions, and so much more! It really is a hugely expansive selection of magical uses. The book doesn't read like a cold reference book. You can hear Tess's enchanting voice throughout the pages. She writes in a down to earth, conversational way. She weaves personal stories and experiences throughout the book, making every section a delight. At the end of every tree section, you will find three magical correspondences: Element, Gender (yep!) and Planet. 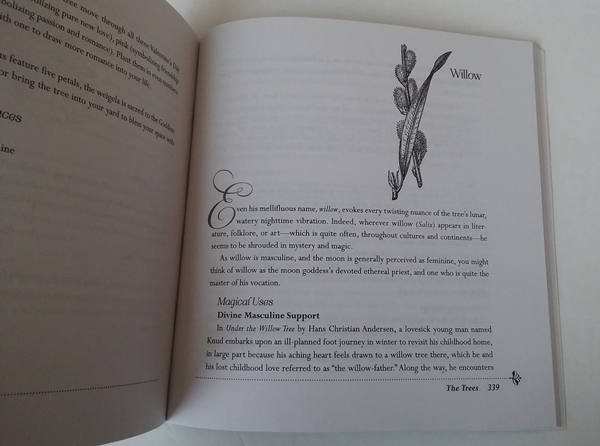 I was thrilled to find that my favorite tree was listed in the book (Willow). For me, anything beyond that was extra! There is something I want to address that bothers me on a soul level about the book. Being a book on the magic of trees, honoring their wisdom, interacting positively with them and asking for their help, it feels wrong that the book wasn't printed on recycled paper. It just made me feel a little hypocritical and sad. 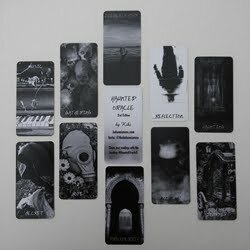 Don't get me wrong, I buy books left and right, but when it's a book or card deck about trees, I feel so much better utilizing tree energy when the tools I am using aren't exploiting/disrespecting the trees themselves. Obviously printing on recycled paper isn't an idea publishers are flocking to. I just thought it would be fitting in this case. To clear my own conscious, I have thanked (and apologized to) the trees that were used to make the book, and my teenagers and I planted 27 trees in their honor (1 in Colorado, which was ravaged by the 2013 wildfires, to honor Tess Whitehurst's new home state, 2 in the South American Amazon Rainforest, 10 in Indonesia and 14 in Haiti.) 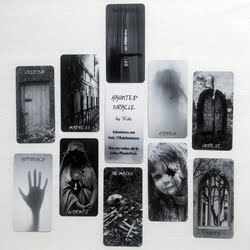 This offering makes me feel more at ease in using the magic in this book. To give you a taste of the book (see above photo), I opened it at random to the Chestnut tree (which is absolutely an amazing bit of synchronicity, as I have had the Billie Holiday song "I'll Be Seeing You" in my head all day, which references a Chestnut tree!). The intro explains that the tree can live to be over a thousand years old and that it produces edible nuts. 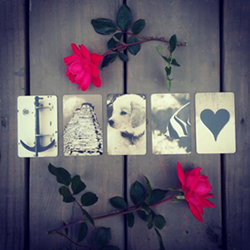 The magical uses include: Abundance, Attracting Animals, Relieving Worry, and Transforming Karma. The section on Abundance states that chestnuts are sustenance, so aligned with abundance. There is a biblical reference to chestnuts and abundance and a Japanese reference to a New Year's chestnut/success tradition. There are also two suggestions on how to use chestnuts in your household for prosperity. The section on Attracting Animals describes some of the animals that are drawn to chestnuts and chestnut trees. The author suggests planting a chestnut tree in your yard to attract animals or to encourage animal communication. The section on Relieving Worry recommends the Bach Flower Remedy made from white chestnut blossoms to relieve worry. There is also information on how the chestnut tree can calm the mind, and how American Indians made chestnut leaf infusions to relieve headaches. 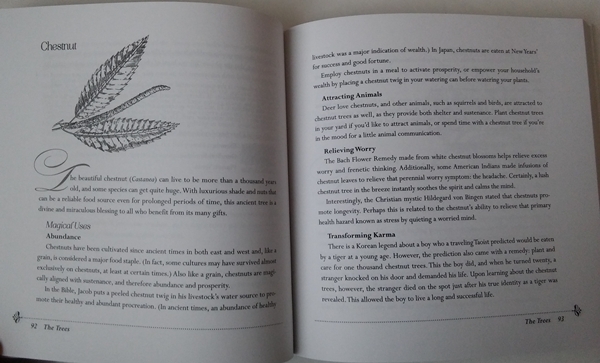 The section on Transforming Karma includes a lovely Korean legend involving chestnut trees and creating good karma. Each tree's magical uses are so varied, that it seems like they are endless! Every tree brings new magical ideas and rituals. But what do you do if the tree you want to work with isn't included in this book? Tess says not to let that stop you! Simply communicate with the tree yourself and use your intuition to hear what messages and magical wisdom the tree has to share with you. 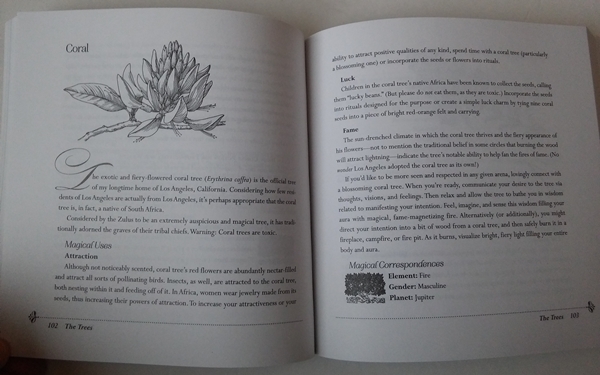 The Magic of Trees is an amazing magical reference guide to working with the energy of trees. It's beautifully written, entertaining, informative, intuitive and enchanting. It's well thought out and well researched. This is one I will refer back to again and again and again. If you feel called to work with trees, you really can't afford to be without this magical tome. 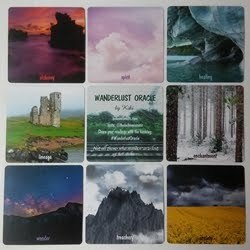 It's a beautiful addition to your book collection, whether your interest is in trees, the metaphysical or both! Book: The Magic of Trees by Tess Whitehurst, published by Llewellyn.